In 2015, natural gas supplied 48.6 percent of New England’s electricity demand, while in 2014, it supplied 43.1 percent. In other words, natural gas supplied 5.5 percent more of New England’s electrical demand after Vermont Yankee was closed, while nuclear power supplied 4.5 percent less. Nuclear generation in New England dropped from 34 percent of the region’s electrical demand in 2014 to 29.5 percent in 2015. The other major change in fossil fuel generation was a decrease in coal generation’s share from 4.6 percent to 3.6 percent of electricity demand. Nuclear power generated about 5 million megawatt hours less power in New England in 2015 than in 2014, while natural gas generated almost 5.7 million megawatt hours more. 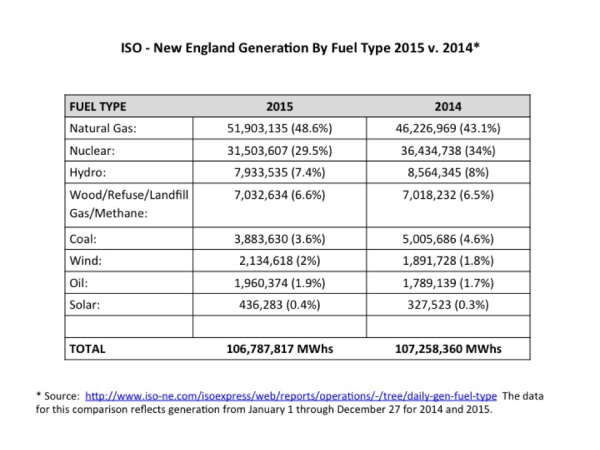 Note also that coal-fired generation produced 1.1 million megawatt hours less electricity in New England in 2015. According to the U.S. Energy Information Administration (EIA), natural gas-fired generators produce 1.21 pounds of carbon dioxide per kilowatt hour and sub-bituminous coal produces 2.15 pounds of carbon dioxide per kilowatt hour). [ii] Using that information, the additional electricity generated from natural gas-fired units in New England in 2015 equals over 3 million metric tons of additional carbon dioxide. However, some of those emissions are offset by the 1 million metric tons of fewer carbon dioxide emissions coming from coal-fired generators. Thus, without Vermont Yankee, New England generators emitted over 2 million metric tons of additional carbon dioxide in 2015. Vermont Yankee is an independent power producer (merchant plant), and as such, the costs associated with its operation and maintenance cannot be recovered through regulated cost-of-service rates. Vermont Yankee’s owner, Entergy, announced in August of 2013 that it would be closing the plant at the end of 2014 due to financial factors that included low wholesale electricity prices reducing the profitability of the plant; the need to invest in significant capital costs to maintain the unit based on NRC’s requirements; and low prices in the regional market for electric generating capacity, which provides revenue to plant owners in addition to their revenues from electricity sales. Low natural gas prices have resulted in low wholesale electricity prices, and have made natural gas the major supplier of electricity in New England. [iv] So, in this context, it is not at all surprising that natural gas substituted for the reduced nuclear power generation from the closure of Vermont Yankee. New England significantly increased its reliance on natural gas as a fuel for electric generation in the past several years. Natural gas provided less than 30 percent of the electricity generated in New England in 2001. But a decade later, the region’s reliance on natural gas generation increased to 52 percent, according to the Energy Information Administration. Unfortunately, transmission pipeline capacity has not kept up with the increased use for natural gas in New England. The lack of sufficient pipeline capacity is more pronounced in winter months, when natural gas is also used to heat homes and businesses. These infrastructure constraints have contributed to the large price spikes in spot natural gas and electricity prices in New England during several cold winters. The closing of Vermont Yankee resulted in additional natural gas consumption as many analysts predicted, and with additional carbon dioxide emissions. Interestingly, Vermont was the first state to ban the practice of hydraulic fracturing, which produces the natural gas that is increasingly used in electrical generation. The shale gas renaissance has produced sustained low natural gas prices and low wholesale energy prices, resulting in financial problems for merchant power plants that cannot get adequate compensation to stay in business, especially due to subsidies and mandates for competing intermittent sources like wind and solar. Prudent management, however, means that diversity of supply issues should be considered. Relying on one major power source without adequate infrastructure could result in less reliable electricity generation and spiking of electricity prices.